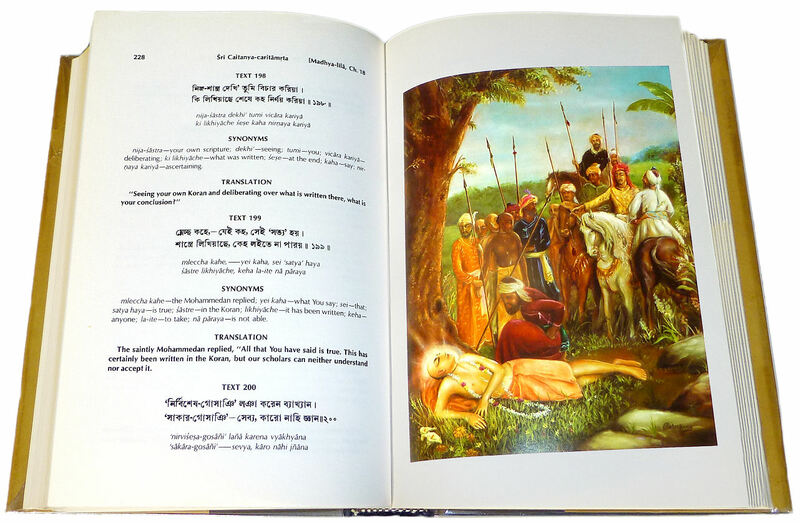 All Text is directly quoted from Caitanya-Caritāmṛta! Summary: While stopping near a village on the way to Prayāga, Śrī Caitanya Mahāprabhu fainted in ecstatic love. Some Pāṭhāna soldiers who were passing through saw Śrī Caitanya Mahāprabhu and falsely concluded that the Lord's associates, Balabhadra Bhaṭṭācārya and others, had killed the Lord with a poison named dhuturā and were taking His wealth. Thus the soldiers arrested them. However, when Śrī Caitanya Mahāprabhu regained His senses, His associates were released. He talked with a person who was supposed to be a holy man in the party. From the Koran, Śrī Caitanya Mahāprabhu established devotional service to Kṛṣṇa. Thus the leader of the soldiers, named Vijalī Khān, surrendered to Śrī Caitanya Mahāprabhu, and he and his party became devotees of Lord Kṛṣṇa. The same village today is known as the village of Pāṭhāna Vaiṣṇavas. While walking, Śrī Caitanya Mahāprabhu, understanding that the others were fatigued, took them all beneath a tree and sat down. There were many cows grazing near that tree, and the Lord was very pleased to see them. Suddenly a cowherd boy blew on his flute, and immediately the Lord was struck with ecstatic love. Filled with ecstatic love, the Lord fell unconscious to the ground. He foamed about the mouth, and His breathing stopped. While the Lord was unconscious, ten cavalry soldiers belonging to the Mohammedan Pāṭhāna military order rode up and dismounted. 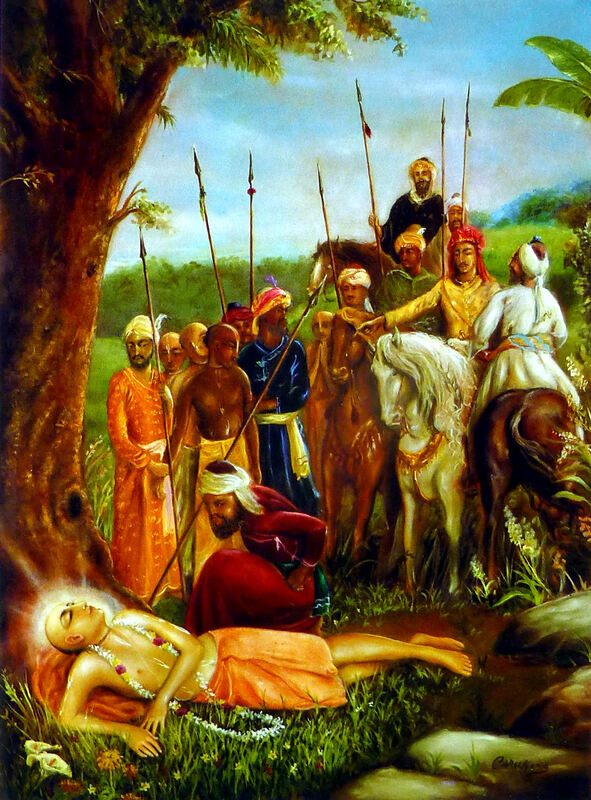 Seeing the Lord unconscious, the soldiers thought, "This sannyāsī must have possessed a large quantity of gold. "These four rogues here must have taken away that sannyāsī's riches after killing Him by making Him take the poison dhuturā." Thinking this, the Pāṭhāna soldiers arrested the four persons and decided to kill them. Because of this, the two Bengalis began to tremble. The devotee Kṛṣṇadāsa, who belonged to the Rājaputa race, was very fearless. The Sanoḍiyā brāhmaṇa was also fearless, and he spoke very bravely. The brāhmaṇa said, "You Pāṭhāna soldiers are all under the protection of your king. Let us go to your commander and get his decision. "This sannyāsī is my spiritual master, and I am from Mathurā. I am a brāhmaṇa, and I know many people who are in the service of the Mohammedan king. "This sannyāsī sometimes falls unconscious due to the influence of a disease. Please sit down here, and you will see that He will very soon regain consciousness and His normal condition. "Sit down here for a while and keep us all under arrest. When the sannyāsī regains his senses, you can question Him. Then, if you like, you can kill us all." The Pāṭhāna soldiers said, "You are all rogues. Two of you belong to the district of Mathurā, and the other two, who are trembling, belong to Bengal." Rājaputa Kṛṣṇadāsa said, "I have my home here, and I also have about two hundred Turkish soldiers and about one hundred cannons. "If I call loudly, they will come immediately to kill you and plunder your horses and saddles. "The Bengali pilgrims are not rogues. You are rogues, for you want to kill the pilgrims and plunder them." Upon hearing this challenge, the Pāṭhāna soldiers became hesitant. Then suddenly Śrī Caitanya Mahāprabhu regained consciousness. Coming to His senses, the Lord very loudly began chanting the holy name, "Hari! Hari!" The Lord raised His arms upward and began to dance in ecstatic love. When the Lord shouted very loudly in ecstatic love, it appeared to the Mohammedan soldiers that their hearts were struck by thunderbolts. Seized by fear, all the Pāṭhāna soldiers immediately released the four persons. Thus Śrī Caitanya Mahāprabhu did not see His personal associates arrested. At that time, Balabhadra Bhaṭṭācārya went to Śrī Caitanya Mahāprabhu and made Him sit down. Seeing the Mohammedan soldiers, the Lord regained His normal senses. All the Mohammedan soldiers then came before the Lord, worshiped His lotus feet and said, "Here are four rogues. "These rogues have made You take dhuturā. Having made You mad, they have taken all Your possessions." Śrī Caitanya Mahāprabhu said, "These are not rogues. They are My associates. Being a sannyāsī beggar, I do not possess anything. "Due to epilepsy, I sometimes fall unconscious. Out of their mercy, these four men maintain Me." Among the Mohammedans was a grave person who was wearing a black dress. People called him a saintly person. The heart of that saintly person softened upon seeing Śrī Caitanya Mahāprabhu. He wanted to talk to Him and establish impersonal Brahman on the basis of his own scripture, the Koran. When that person established the impersonal Brahman conception of the Absolute Truth on the basis of the Koran, Śrī Caitanya Mahāprabhu refuted his argument. Whatever arguments he put forward, the Lord refuted them all. Finally the person became stunned and could not speak. Śrī Caitanya Mahāprabhu said, "The Koran has certainly established impersonalism, but at the end it refutes that impersonalism and establishes the personal God. Purport Text 190: The revealed scripture of the Mohammedans is the Koran. There is one Mohammedan sampradāya known as the Sufis. The Sufis accept impersonalism, believing in the oneness of the living entity with the Absolute Truth. Their supreme slogan is "analahak." The Sufi sampradāya was certainly derived from Śaṅkarācārya's impersonalists. "According to the Koran, the Lord has a supreme, blissful, transcendental body. He is the Absolute Truth, the all-pervading, omniscient and eternal being. He is the origin of everything. "Creation, maintenance and dissolution come from Him. He is the original shelter of all gross and subtle cosmic manifestations. "The Lord is the Supreme Truth worshipable by everyone. He is the cause of all causes. By engaging in His devotional service, the living entity is relieved from material existence. Purport Text 194: According to the Mohammedan scripture, without evādat, offering prayers at a mosque or elsewhere five times daily (namāja), one cannot be successful in life. Śrī Caitanya Mahāprabhu pointed out that in the revealed scripture of the Mohammedans, love of Godhead is the ultimate goal. Karma-yoga and jñāna-yoga are certainly described in the Koran, but ultimately the Koran states that the ultimate goal is the offering of prayers to the Supreme Person (evādat). "The happiness of liberation, whereby one merges into the Lord's existence, cannot even be compared to a fragment of the transcendental bliss obtained by service unto the Lord's lotus feet. "In the Koran there are descriptions of fruitive activity, speculative knowledge, mystic power and union with the Supreme, but ultimately everything is refuted as the Lord's personal feature and His devotional service is established. "The scholars of the Koran are not very advanced in knowledge. Although there are many methods prescribed, they do not know that the ultimate conclusion should be considered the most powerful. "Seeing your own Koran and deliberating over what is written there, what is your conclusion?" The saintly Mohammedan replied, "All that You have said is true. This has certainly been written in the Koran, but our scholars can neither understand nor accept it. Purport Text 200: The saintly Mohammedan admitted that those who were supposedly conversant in the teachings of the Koran could not ultimately understand the essence of the Koran. Because of this, they accepted only the Lord's impersonal feature. Generally they recite and explain this portion only. Although the transcendental body of the Lord is worshipable, most of them are unaware of this. "Since You are that very same Supreme Personality of Godhead Himself, please be merciful upon me. I am fallen and unfit. "I have studied the Mohammedan scripture very extensively, but from it I cannot conclusively decide what the ultimate goal of life is or how I can approach it. "Now that I have seen You, my tongue is chanting the Hare Kṛṣṇa mahā mantra. The false prestige I felt from being a learned scholar is now gone." Saying this, the saintly Mohammedan fell at the lotus feet of Śrī Caitanya Mahāprabhu and requested Him to speak of life's ultimate goal and the process by which it could be obtained. Śrī Caitanya Mahāprabhu said, "Please get up. You have chanted the holy name of Kṛṣṇa; therefore the sinful reactions you have accrued for many millions of lives are now gone. You are now pure." Purport Text 207: After being initiated, the devotees in the Kṛṣṇa consciousness movement change their names. Whenever a person in the Western world becomes interested in this Kṛṣṇa consciousness movement, he is initiated by this process. In India we are falsely accused of converting mlecchas and yavanas into the Hindu religion. In India there are many Māyāvādī sannyāsīs known as jagad-guru, although they have hardly visited the whole world. Some are not even sufficiently educated, yet they make accusations against our movement and accuse us of destroying the principles of the Hindu religion by accepting Mohammedans and yavanas as Vaiṣṇavas. Such people are simply envious. We are not spoiling the Hindu system of religion but are simply following in the footsteps of Śrī Caitanya Mahāprabhu by traveling all over the world and accepting those who are interested in understanding Kṛṣṇa as Kṛṣṇadāsa or Rāmadāsa. By the process of a bona fide initiation, their names are changed. Vijulī Khān was very young, and he was the son of the king. All the other Mohammedans, Pāṭhānas, headed by Rāmadāsa, were his servants. Vijulī Khān also fell down at the lotus feet of Śrī Caitanya Mahāprabhu, and the Lord placed His foot on his head. Bestowing His mercy upon them in this way, Śrī Caitanya Mahāprabhu left. All the Pāṭhāna Mohammedans then became mendicants. Vijulī Khān became a greatly advanced devotee, and his importance was celebrated at every holy place of pilgrimage. Purport Text 213: The word yavana means "meat-eater." Anyone from a meat-eating community is called a yavana. One who does not strictly observe the Vedic regulative principles is called a mleccha. These words do not refer to any particular man. Even if a person is born in a brāhmaṇa, kṣatriya, vaiśya or śūdra family, he is a mleccha or yavana if he does not strictly follow the regulative principles or if he eats meat. So as can be clearly seen, Krsna, Himself, as Sri Caitanya Mahaprabhu, did not reject the Koran or Islam, but rather encouraged the Muslims to recognize its authentic meaning. Prophet Mohammed recognized that the people of Arabia were hopelessly lost in rituals and idol worship and had forgotten that the goal of all worship is to please God. By removing the many diversions, he was able to focus his followers attention on the worship of the Supreme Godhead, who is the source of all the demigods and the goal of all sacrifice, charity, prayer and worship.